Sleeping arrangements and room assignments in a family our size are topics I get asked a lot about. Room sharing, while something that used to be commonplace, is not as common today in the world of 4 bedroom houses coupled 4 person families. In bigger families or families with small homes room sharing is something that needs some consideration. We have recently changed up our room arrangements and thought we’d share what has worked over the years. When we moved in we had one boy, one girl and a 3 bedroom home. Our children each had their own rooms and we were SPREAD OUT! Then when our third child was born (a boy) we moved him in with his brother. Two more girls were added when baby #4 and #5 were born and we had a girls room (3 girls) and a boys room (2 boys). We got the surprise of a lifetime when we found out our 6th child would join us and he joined the boys’ dorm with a total of 3 girls in the girls room and 3 boys in the boys room. When our 7th child (our 4th girl) showed up we originally thought we would add her into the girls’ room and just figure out how to make the small closet work more efficiently. But before she was ready to move in (most our babies sleep with us for 6-12 months) our home school room in the basement was loosing its luster because it had slowly become too small of a space to contain 7 kids all doing different things. I decided to move the school room upstairs and convert our formal dining room into a dining room with a dual purpose. 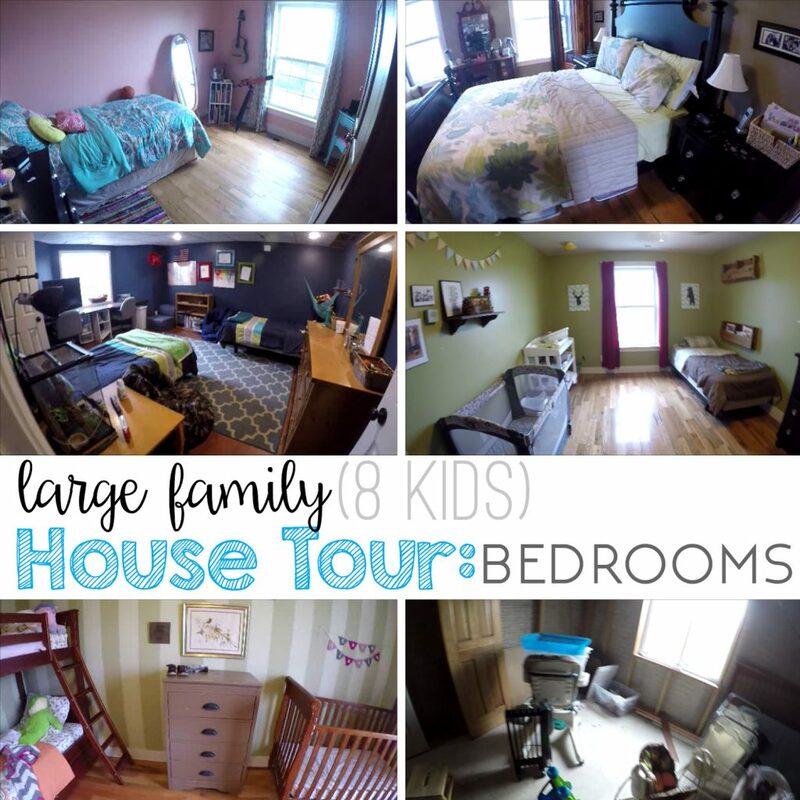 Since we now had a fully finished room where our home school room used to be we decided to utilize that as a room for our older two boys and move our oldest daughter in with our youngest son and leave the little girls room head count at 3 (our youngest 3 girls). Fast forward to 2016 and we are expecting our 8th child and our older kids are now teens/tweens. Converting the office and finishing off the basement sounded like a good move so we went for it. Hopefully this fall we will have our final (6th room) finished and our oldest 3 kids will have their own room and our youngest 5 will share 2 bedrooms. The shared bedrooms will be set up as follows: 1 “little boys room” with Ezra and Cypress and 1 “little girls’ room with our youngest three girls: Faith, Georgia and Cora. Now, if that didn’t make your head spin I don’t know what will. You can click on the video links (hyperlinked above to see the previous set ups) to hear the story in part 1 and see a bedroom tour of all the rooms in part 2.